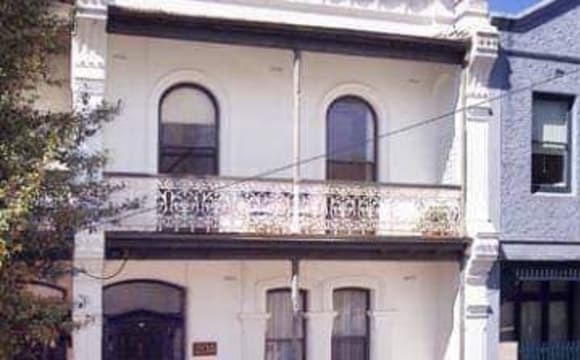 House is on Capel street, North Melbourne - 10 min walk from CBD, 5 min from Queen Vic Market and Errol St where you can find lots of shops and cafes. Right by the 58, 59 and 19 tram stops. Honestly couldn't be more perfect! It's not a new home and it has aged but one thing that we have found in this house is that it is very homey, especially with friendly housemates who respects your privacy but still socialise with you every now and again. We do tend to share food sometimes but have been busy recently considering most of us have 2 jobs. It is also not a party house but we do like to get together sometimes. About the room: It is a 2 story house and the 2nd floor is all yours. You have a really nice natural light and full privacy as you have your own floor for yourself. You also have your own full bathroom and everything else is downstairs. 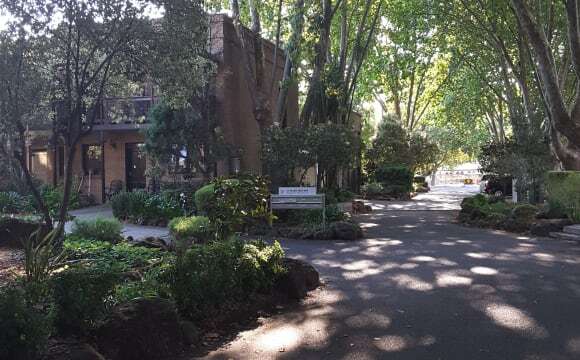 What's also great about this house is that the location is very accessible: Flemington is only a few stops by tram and has quite a few good restaurants. Woolworths and Chemist warehouse is a 5 minutes tram stop away. If you want something closer then IGA is only 8mins walk. If you are feeling lazy to do laundry or need a dryer, we have a laundry mat just 2 buildings away from the house. Tram stops are only 2 minutes walk and takes you 15mins to get to the city. Flemington Station is 7 minutes walk away from the house and takes 15 mins to get to the city. Royal Melbourne Hospital is only 8mins tram ride. This is wonderfully renovated old warehouse. High ceilings and lots of space. Only 4 of us are currently living in the house, so looking for a fun 5th to join the house. The Bathroom has seperate shower and bath. Both bathroom's have two sinks. The house has 3 balcony's where it’s always nice to chill and have a drink on a sunny afternoon. We have a big 75inch tv, with Apple TV, Netflix, Stan and all the others. The house also has central gas heating through-out. The property is fairly new, the previous tenants were the first in the flat and they had treated the space very well. The flat is a 3-minute walk from a tram hub in front of the Royal Children's Hospital, so the CBD is easily accessible. We have very efficient and effective AC units in each room, and 3 grocery stores within an 8-minute walking distance. I love this flat to bits, it's a safe refuge from my life at the laboratory and I hope any prospective flatmates treat this home with the love and respect it deserves. 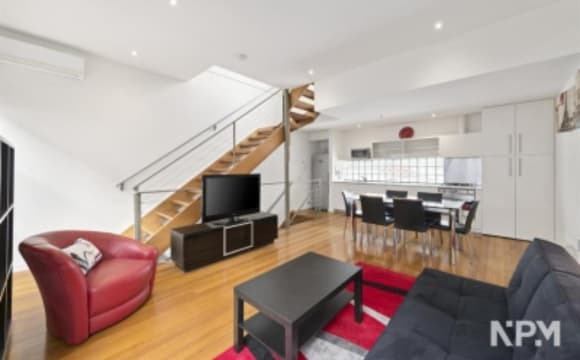 This apartment to right next to a tram stop that goes to either Melbourne University or CBD. NOT AVAILABLE UNTIL - 1 MAY 2019 NORTH MELBOURNE IS SO CONVENIENT Situated in a lane off North Melbourne's delightful Errol Street shops, with great cafes, supermarket, library, bar and pubs nearby. STUDIO LAYOUT Enormous 100m2 fully furnished self contained warehouse studio apartment. Ground level contains open plan kitchen, breakfast bench with stools, full dining suite, lounge area. In a private second room is a laundry/bathroom containing large shower, laundry basin, toilet, washer/dryer and a large linen cupboard. Upper level huge mezzanine bedroom has Queen size bed, wardrobe, desk, and fold up double Futon to accommodate additional person(s). LOVE COOKING? Gourmet kitchen is ready to start entertaining with dishwasher, double sink, full stainless steel bench tops, double door refrigerator, microwave, oven, toaster, kettle, crockery, glassware, cooking utensils. STAY WARM You will not be cold as we have solar-powered hydronic heating throughout the studio including heated towel rails. 100% fresh air system too. This is a really spacious, cosy apartment. WALK OR TRAM EVERYWHERE Two minute walk to the 57 tram. Ten minute walk to the Queen Victoria Market. Walking distance to RMIT, University of Melbourne, hospitals (Royal Melbourne, Womens' and Childrens'). Hello potential sub-letters/long-term housemates. If you're looking for a cozy, comfortable, and well located/appointed townhouse for an initial 2months stay while you find your feet here in Melbourne (or perhaps a longer term arrangement if that's where you're at), then drop me a line. Warm regards, Pete *It's in a tree-lined and lush garden setting in a popular part of North Melbourne. *Walking distance (5-10mins) to many of the suburb's main attractions including Errol St cafes, eateries, bars, shops, Post Office and library, plus the 57 tram stop is a 2min walk away. *Nearby are numerous shady and inviting parks, the North Melb pool and Rec centre. *If you drive a car, there is easy access to CityLink, the CBD and the Inner west. *I have Internet and Netflix included in the rent, all bills and utilities as well. *A/C downstairs and fans/heaters upstairs in the bedrooms. *The kitchen is well stocked and highly functional. Washer and dryer in the laundry. MOVE IN ASAP We are looking for new tenants to take over our brand new 2 bed, 2 bathroom apartment in the heart of North Melbourne. We are looking to do a lease transfer which is $220 per tenant. 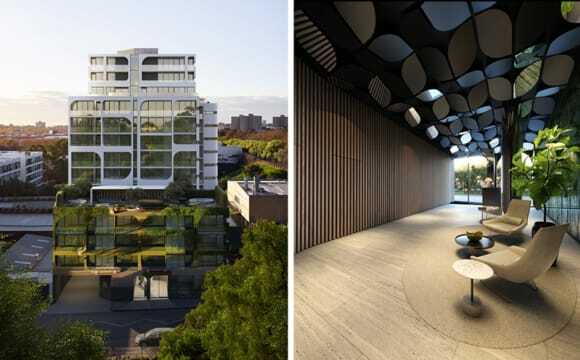 LOCATION: This location places you a 10-minute walk from North Melbourne Station, 7-minute walk to Queen Vic Market, 10 minutes to the CBD with the 57 tram line outside your door that will have you in the city in 10 minutes. PERFECT for those without a car. MAIN BEDROOM: has a large walk-in robe which leads into an ensuite, and also includes a private courtyard which brings lots of light into the bedrooms as they are situated at the back of the apartment. BEDROOM 2: has spacious built in robes and could be considered to have its own ensuite as the second bathroom/laundry is just across the hall. Both bedrooms are fitted with ceiling fans and have remote controls :) - This apartment is one of only 9 in the block so it's a nice little community and we are situated on the first floor. - North facing apartment pours the morning sun into the open plan kitchen and living space. - Concrete walling provides amazing insulation so the A/C and heater are barely used. - Another plus is the real estate agency JMRE is 150 metres away. - Every appliance in the house is brand new and in perfect working order. We are all travelling and have decided its sadly the best move to give up our lovely home so we are looking for new tenants to take over on the 1st of May for the remaining 6 months (resigning the lease is a sure thing if desired). * Rent is due on the 1st of every month. It has a gym, pool and laudry on the property. its an easy place to meet friends becuase everyone is around the same age. the rm's are very supportive and there is 24 hour security so you feel very safe living there. A fully furnished apartment available to move in at North Melbourne just a couple of blocks from Melbourne Uni and RMIT. Perfect for private accommodation and independent living. A convenient store just outside the door and a short walk to the CBD. 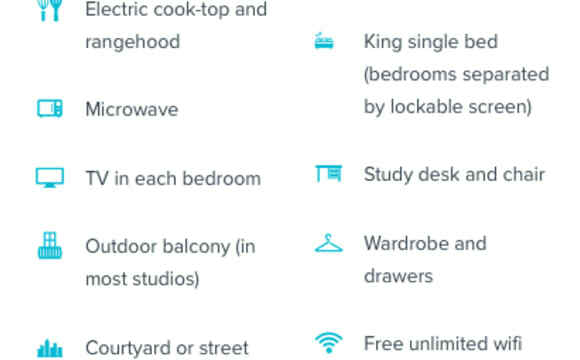 It includes your own private bathroom, a kitchen with a pantry cupboard/wardrobe, gas cooktop, fridge/freezer and a microwave oven, and its NBN ready. The room is furnished with a double bed with a bedside table, a dining table with chairs, a study desk with chair and study lamp, and a wall mounted TV. Apartment facilities include a communal lounge with large screen TV, a terrace with free BBQ facilities, study areas, laundromat and a bicycle shed. Location: - 3 mins away from tram stop which brings you directly into the city in 10mins - drops straight in front of RMIT campus - 10-15mins tram ride to Melbourne Central (3 mins walk to QV mall) - 5-10 mins tram ride to Queen Victoria Market - Trams are frequent (so not to afraid to miss out and have to wait a long time for another one!) - Near to nice cafe and restaurants such as Auction Rooms Cafe and KL Bunga Raya. 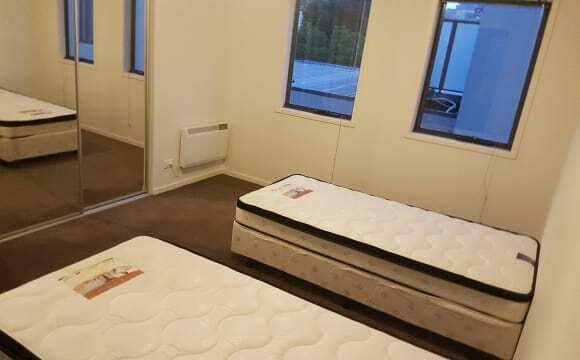 - Amazing location for University of Melbourne students (7 mins walk from Commerce building and 10mins walk to main campus) -Near the North Melbourne Post Office -Near Royal Park and Flagstaff Gardens(10mins away) Only one room available to let to any gender at the End of April 2019. 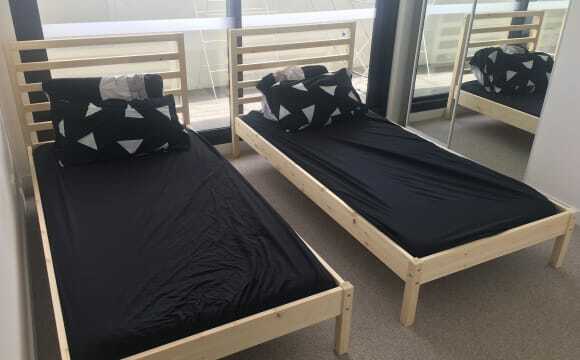 Bed frame, mattress and table are different from those in the picture. (Please note: There is a queen size mattress, bed frame, and side table, rice cooker, heater available for sale at additional costs) Location: 68 Leveson Street House Type : 2 Bedroom 1 Bathroom [only 1 bedroom for rent - as shown in image] Rent : 320$ PW Bills not included. Minimum Stay : 3 months minimum stay (preferably to stay until end of the year) Rental Period: Available from the end of April. Facilities : rooftop bbq Please pm me if interested. Thanks! We are renting our large master bedroom in a 3BR house located on North Melbourne. Just 2 stops from the free tram zone and 10 minuts walking to the Victoria Market and CBD. This modern and lovely house is full of natural ligth and space, the bedroom is on the third floor FULLY furniture with a balcony and BBQ, huge wardrobe and private bathroom. Parking space included. Non-students and students welcomed to apply Private studio available. Window looking out into a beautiful courtyard. Self-contained, neat and spacious. 5 minute walk to University of Melbourne, Royal Melbourne Hospital. 10 minute walk to the CBD and Queen Victoria Market for all your shopping needs. Tram just at your doorstep to CBD and train station. Inquire now.